I love this movie. 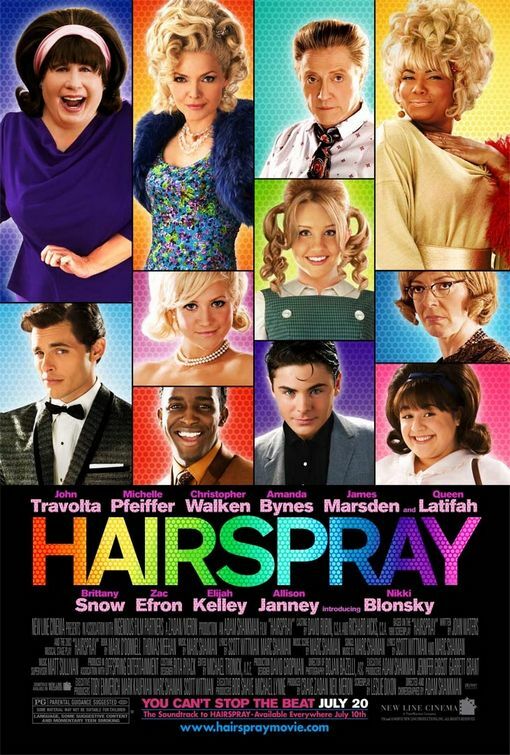 My sister will say that’s only because Zac Efron is in it (I won’t deny it– he was a large part of the appeal originally), but really it’s because Hairspray is just a lot of fun. The songs are catchy, the humor is a mix of silly and edgy, and the performances are excellent. Besides, where else are you going to find such a loving, yet accurate ode to the city of Baltimore? Hairspray is to the 1960s what Grease is to the 1950s. This is one of the main reasons why I love it so much. The similarities between the two are so numerous, that I’m ashamed to say it took me at least three viewings to pick up on them (I was distracted by Efron’s dreamy eyes, OK? ): poking fun at their respective decades through original songs that channel the sound of the times*, innuendo laced humor from innocent characters, amazingly choreographed dance numbers, fun costumes, John Travolta… They’re practically the same movie, right? Not really. Where Grease is pure fluff, Hairspray actually addresses the struggles of the 1960s. Sure, silly mindless fun is great at times, but I appreciate that Hairspray actually makes a statement about racism in America. It would be incredibly disingenuous of it not to, given that racial integration would have been a hot topic in 1960s Baltimore. Still, my favorite songs are the more humorous ones– “Good Morning, Baltimore!” and “I Can Hear the Bells” in particular. However, all the music here is excellent. It’s a rare musical that can successfully blend catchy dance numbers with heartfelt pleas for tolerance, and Hairspray does the job well. The casting in this movie is particularly inspired. Obviously I love Zac Efron as dreamboat Link Larkin, but Christopher Walkin, Michelle Pfeiffer, and Queen Latifah are all perfect choices for their roles. Nikki Blonsky is delightful as the infectiously happy Tracy Turnblad, and pre-mental break down Amanda Bynes is excellent as her sheltered best friend, Penny. A lot of media attention was given to John Travolta as Tracy’s mother, Edna, but his performance is actually my least favorite of the entire cast. He’s great in the role, but is easily overshadowed by everyone else. I also found him to be a bit too light on his feet, often making the fat suit he wears look and feel fake. I can almost believe that he’s really a woman, but the entire package isn’t quite as convincing as I’d like it to be. Hairspray has quickly become one of my favorite movies, and a go-to film when I want to watch something fun and happy. If only all musicals were as great as this one. *I’m hoping someday I’ll get a similar musical set in the 1980s. Rock of Ages is terrible and does not count. This movie is ok. It has a terrific cast, even if I don’t quite understand why John Travolta had to be cast as an overweight mother. The songs are catchy and there is fun to be had in this remake of the 80s musical which went on to become a big hit on Broadway. Nikki Blonsky plays Tracy Turnblad, an overweight high schooler who loves to dance and sing in her home town of Baltimore. The film is set during the Civil Rights era, and Tracy is keen for her black buddies to get some equal rights. She becomes a quasi-star when she auditions to be on a local television show hosted by Corny Collins (the always unlucky in love, Cyclops). She uses her new found fame to raise awareness about the plight of her African American friends, which annoys the show’s producer (Michelle Pfeiffer). Tracy must decide if she wants to keep being on a racially insensitive television show, or do what is right and help her friends (guess what she does?). Along the way, her mother (Travolta) and father (Christopher Walken) have issues of their own and also don’t want their daughter getting caught up in a dangerous Civil Rights movement. This is a terrific cast of people who can actually sing. Outside of Travolta and Pfeiffer, Zac Efron, Amanda Bynes, Queen Latifah and Brittany Snow also appear. The songs are really catchy. In the end though, this is not as good as something like Grease, which we watched not long before this movie. Hairspray is not as captivating or entertaining as that movie. I also really struggled to understand why John Travolta would get cast as a woman. It just screamed of stunt casting to me. Sally explained to me that this role has always been played by a male actor. I don’t buy it. Every time Travolta appears on screen, you are distracted by the fact that this is a man dressed up as a woman. If he actually looked like a woman, perhaps it wouldn’t be, but Edna Turnblad just looks like John Travolta in a wig and a fat suit. It is very distracting to me, and I’m not sure I understand what the message behind this casting was meant to be. This is an average movie. The solid cast and catchy music cannot save an unoriginal story we have seen a million times before and possibly the worst case of stunt casting I’ve ever seen. If you want to watch a great musical, stick to Grease.